Candy, fruit juice, soda, and other foods that contain sugar are VERY rough on your body. 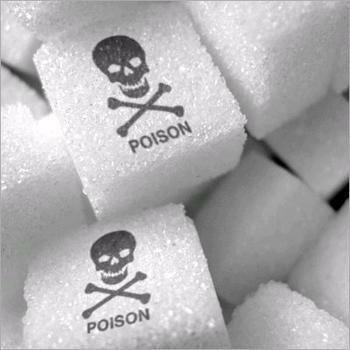 Sugar is a poison to your systems. It elevates your blood triglycerides, lowers HDL cholesterol (the good kind), contributes to yeast growth, promotes deleterious gut bacteria, causes weight gain, fogs your brain, saps your B vitamins, and rots your teeth. Getting a hit of sugar results in a blood sugar spike followed by hypoglycemia (low blood sugar). For more information on this cycle, check out: Understanding Insulin, No Biochemistry Needed. The sugar rush/sugar crash cycle leads to headaches, insulin resistance (prediabetes), dizziness, anxiety, trembling, and irritability. Also, sugar messes with your fat-burning system. When the sugar blast starts the release of extra insulin, the insulin starts the process of moving fat from your bloodstream into storage sites… FAT CELLS. And then, your body halts a hormone called glucagon from entering your blood stream. This is bad because glucagon is the key to unlocking your fat stores. Soooo, you can’t burn fat after you’ve eaten sugar, until all the insulin is cleared from your system and glucagon can start working again. The total effect of this cycle is fatigue (and eventual burnout) of your pancreas, as well as rapid conversion of ingested sugar into stored fat. Ok, now that we’ve got that out of the way, here is a simple sugar primer for my Reno Personal Training crew. Make sure to look out for these on labels! Sucrose – Commonly called sugar or table sugar, this is a combination of glucose and fructose. Some foods may try to trick you by calling it “organic evaporated cane juice.” Don’t be fooled, it’s still sugar. Fructose – This is also called fruit sugar. 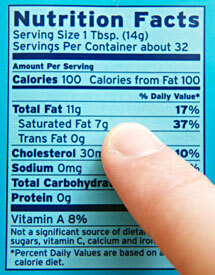 May be one of the most fat-storage-promoting of the sugars, the more fructose, the more fat you store. Glucose – You won’t see this one on many labels, but it pops up occasionally in supplements and sports drinks. It is the basic form of sugar that your cells can use for energy. Dextrose – Another name for glucose. Brown Sugar – White sugar covered in a film of molasses. Molasses – An end product made by refining sugarcane juice. Raw Sugar – Also called turbinado sugar. This is a partially refined sugar from sugarcane juice. Coconut Sugar – Slightly less glycemic sugar made from the sap in coconut flowers. Agave Syrup – Also called Agave Nectar. It is the processed juice of the agave plant. It may actually be worse for you than high fructose corn syrup, despite the fact that it is marketed as a “healthy” alternative. Corn Syrup – Made from glucose and water, produced by processing cornstarch. High Fructose Corn Syrup – Extremely processed sweetener used in most processed foods. Avoid ANYTHING that has high fructose corn syrup if you want to lose weight or be healthy. Liquid poison. To reiterate: If a packaged food has any of the above on the label, beware – they’re trying to hide the sugar from you. 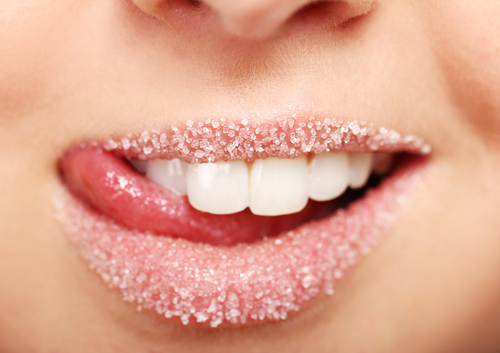 The Sweetest Scam Of All Time <- Would you live longer on sugar water or plain water? Startling Facts About Sugar <- Did you know that 90 cents out of every food dollar is spent on something that contains high fructose corn syrup? Household Uses For Soda (Besides Drinking It) <- Fun but true facts of around-the-house uses for soda such as… cleaning oil stains off concrete!